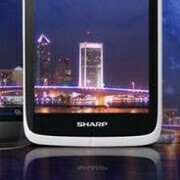 Sharp Aquos Phone SH930W is a kind of a phone that many have been dreaming of. Featuring a 5-inch 1080p FullHD screen of Sharp IGZO technology for better quality and power consumption, it promises a lot. And now, it has been announced to be coming to Russia in the near future. However it is not all roses. The Sharp Aquos SH930W runs on a 1.5GHz dual-core Snapdragon S4 chip with Adreno 225 graphics and that is just not enough to drive that many pixels. You’d notice this mostly in games - GLBenchmark 2.5 in one of its graphical tests only yielded 13.6 frames per second, while for normal gameplay you need around 30fps. Still, the device has tons going on. It features Android 4.1 Jelly Bean, and internal storage is expandable via microSD. Competition in definitely heating up. HTC is bringing its Droid DNA with a similar 5-inch 1080p display, and others are rumored to follow suit. But so far, Sharp might have a chance to actually sell some of these. "1.5GHz dual-core Snapdragon S4 chip with Adreno 225 graphics and that is just not enough to drive that many pixels" Ok so why would we buy this? SHARP is oone of the best coming to displays but their overall phone product finishing needs a lot of work! so what specs should one look for to have better experience playing games in their phone? And the bezels look too thick, may be the real thing looks better? The screen technology is one of the best, just wish it could be found in an awesome toy maybe from HTC. but its a bad day for Sharp since most OEM are coming up with an awesome screen technology of their own. talk about LG and their LCD nova, IPS .. Sammy and their super AMOLED, SONY with Bravia ...itree and? ???? I hope you're being sarcastic, guy. Let's talk about battery life.. I'm still kind of thinking HTC when I look at the white colored device especially. Kind of resembles the One X from my eyes. its a very good phone... but i wish its a s4 pro processor!